This interview originally appeared on VoyageATL.com. Click here to view on their website. Today we’d like to introduce you to Robbin Jorgensen. Robbin, please share your story with us. How did you get to where you are today? There’s so many things that led me to create the Women Igniting Change® movement and my company. I would say first and foremost was my corporate career as a Regional Sales Director in upstate New York and Connecticut. I had an amazing 20+ year career in sales and marketing. I was fortunate enough to lead extraordinary teams and yet at the same time I felt like I experienced what many women leaders do and that is, the higher I climbed that ladder the more of me I lost. It felt like I had to lead a certain way, I had to act a certain way and there was this norm that I was supposed to conform to that didn’t feel authentic. It felt like I walked into my office and put on a mask every day and then took it off when I got back home. That eventually took a toll of my health and my mindset. My family noticed it, my friends noticed it and then one day one of my colleagues suggested that I hire an executive coach. I didn’t know what coaching was at the time so I was intrigued. I did my research, hired my first coach and worked with her for a year. That experience started me on a transformational journey into really understanding what it took to show up as the real me AND be a strong female leader at the same time. She really helped me remember who I was before the world told me who I should be. That experience opened my eyes to the challenges that my female colleagues and the women on my team faced as well. I began wanting to have a greater impact in addressing the systemic issues that women face in the workplace. I would say that the second catalyst that led me to create the movement and my company was participating in a ten month long experiential leadership program through the Coaches Training Institute. This program helped me not only build on my natural strengths as a leader but also determine how I wanted to show up in the world, who I wanted to serve, and what I wanted my impact to be. I founded Women Igniting Change® on the belief that everything shifts the moment a woman realizes she has within her the ability to spark tremendous change in the world. She can no longer stay silent, and she becomes a catalyst for action. We now reach women in 46 countries around the world. I don’t feel any road is as smooth as you’d like it to be when you’re building a company from scratch. One of the biggest struggles was starting a new company in a new city (I’ve only been in Atlanta for 7 years). When I first moved here, I knew my fiance’ and a handful of amazing women whom I had met during coach training – that was it. So, rebuilding my network took some time and a lot of effort. Something that I would consider more of an awareness rather than a struggle was, what it took to create all of the systems and structures that are required to run a successful business. When you’re in ‘Corporate America’, you have all the resources in the world, but once you get out in the real world, you quickly realize that you need to create all of that yourself. We’ve done it, but in the early years, figuring out the best approach took some trial and error. So, as you know, we’re impressed with Women Igniting Change® – tell our readers more, for example what you’re most proud of as a company and what sets you apart from others. Women Igniting Change® is a global purpose driven organization geared toward unleashing the contribution of women around the world. We have several focus areas. First, would be our work in the corporate space where we support forward-thinking organizations committed to fully leveraging the strategic potential of their women leaders. We help them create and execute comprehensive solutions without ever losing sight of the business case or the imperative around doing it. Some of the organizations we work with include Microsoft, Oracle, Bank of America, Deloitte, and General Electric. We love being different. We’re known for disrupting the status quo and offering innovative programs that aren’t “business as usual.” All of our programs are interactive and experiential and tie back to the bottom line. We want the organizations we work with to get a solid ROI all while driving actionable change. We want women to come to our programs and be IN the content with us. We take a stand for transformation, not just education. Second would be our speaking platform. We love engaging with associations and women’s groups, not only to discuss the benefits of gender equality and the positive impact it can have on organizations, but also how women themselves can become catalysts for change, whether inside their organization or out. Another is, by working with women both on the ground and virtually in Rwanda and Uganda helping them with business, leadership and entrepreneurial skills. I am honored to be the U.S. Ambassador for AVEGA, an organization dedicated to supporting and empowering widows of the genocide against the Tutsi in Rwanda. These are some of the most extraordinary women I’ve ever had the privilege to meet. Their resilience, compassion, hope and fortitude are lessons that we as a company strive to embody every day. Oh wow…. so many things. I love the vibrancy of Atlanta and the rich history that’s everywhere you look. As a global traveler, I love the convenience of having an international airport that offers easy access to anywhere I need to go. And, I love the southern hospitality that is the heartbeat of Atlanta. 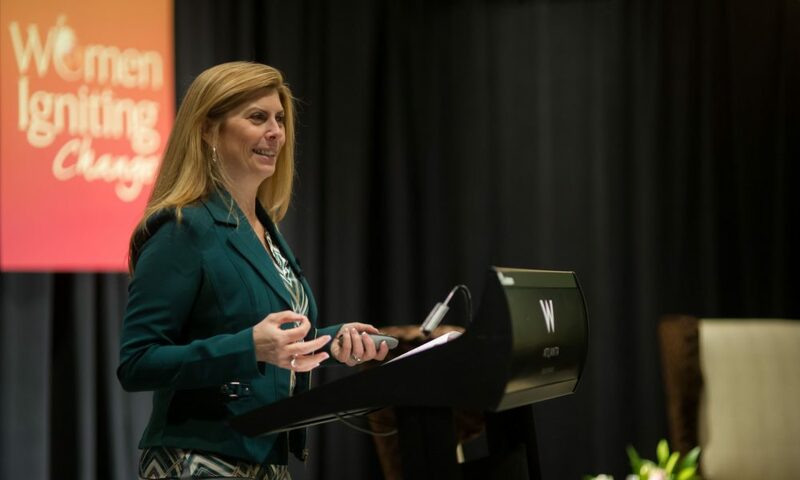 Robbin Jorgensen, CPCC, PCC, is the Founder and CEO of Women Igniting Change®, a global purpose-driven organization geared toward unleashing the contribution of women around the world. Robbin is a highly successful businesswoman with 20+ years of experience in sales and marketing, training and business development. A sought after speaker and womens leadership strategist, she is a staunch advocate for women and girls around the world. She is the U.S. Ambassador to Rwanda’s AVEGA Agahozo, an organization dedicated to the empowerment of women and is on the Board of Advisors of the Center for Leadership & Service for the State University of New York at Albany.